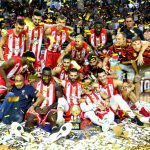 Crvena Zvezda “Red Star” Beograd destroyed KK Buducnost Voli Podgorica in Game 2 of their ABA Liga finals series 107-69, taking one step closer to claiming the title. The red and white shirts put on an impressive clinic, leading in this game from start to finish. They were never really challenged by Buducnost and were able to cruise to an easy victory. Game 3 will be held on April 17th with Buducnost having their backs to the wall in a do-or-die situation. Buducnost’s starters could not get it going on offense and they were outgunned by Red Star. 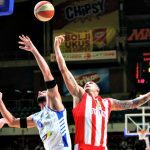 A defining factor in the win for Crvena Zvezda was in the 3-point shooting department. They hit 12-of-25 shots from long range, compared to Buducnost who struggled to make their 5-of-17 from distance. 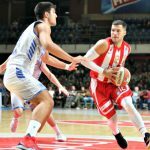 Defense also played a key role in the result here as Crvena Zvezda were able to take better care of the ball with just seven turnovers on the night, compared to 14 by the white shirts. With the game in hand early, Crvena Zvezda allowed their reserves to run with the game, giving them some extra run considering the comfortable advantage that they had. Stratos Perperogoulo was a machine, scoring 17 points on 7-of-8 shooting with three 3-pointers in only 12 minutes on the floor. K.C. Rivers came through off the bench as well with 16 points and five assists of his own. Buducnost was led by Nemanja Gordic, who mustered 11 points. Filip Barovic and James Bell added 10 points each as the only other white shirts to score in double figures on the night. 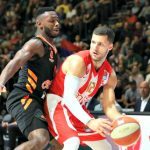 As things stand now, Crvena Zvezda has everything going their way and Buducnost will have to dig deep in order for Red Star not run away with a sweep in the ABA Liga finals.